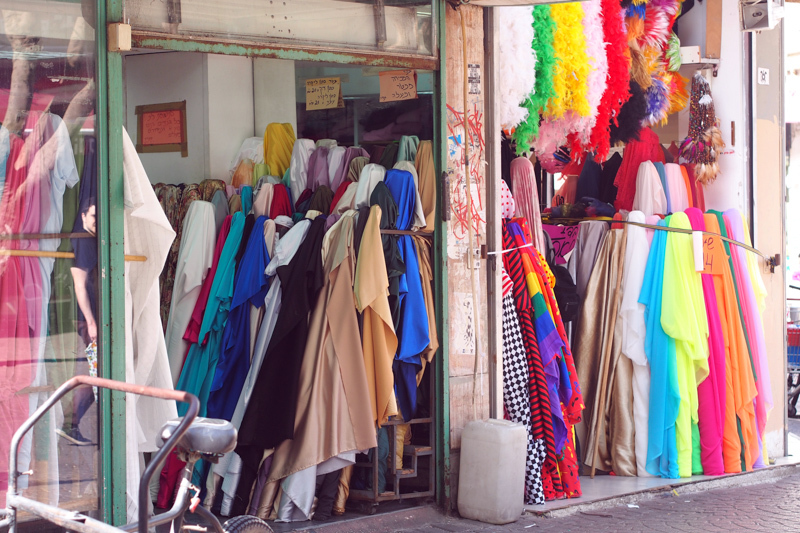 Naturally the purpose of visiting wasn’t primarily to shop for fabric, but I did a little research before going and found that there’s a street called Nakhalat Binyamin that seemed to contain all the fabric shops. Pleasingly it was pretty near where we were staying so we popped over there once. Or twice. 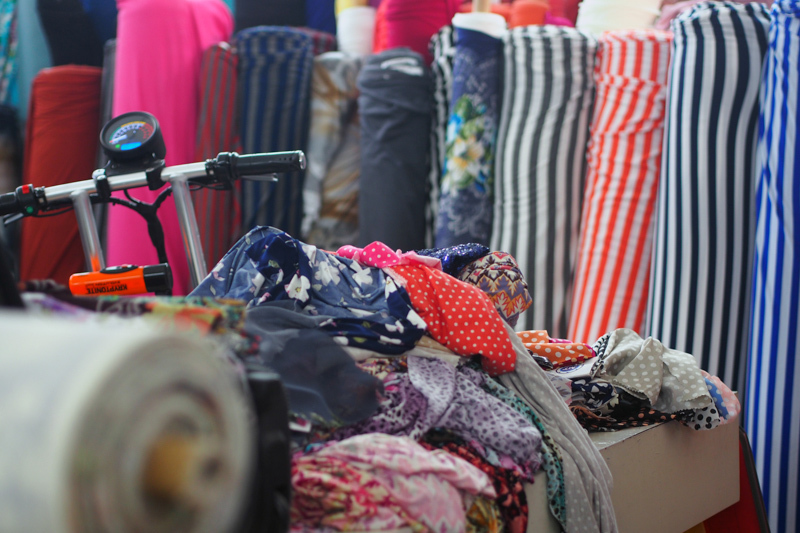 The fabric shops start right where the farmers’ market ends, and the top of the street is pedestrianised which makes for a nice window-shopping experience. 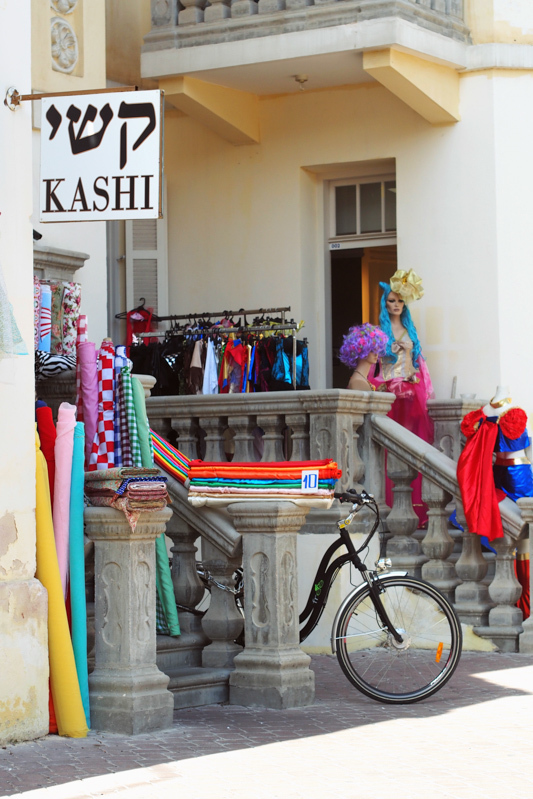 The shops’ wares spill colourfully onto the street so my sewing-sense immediately started tingling. 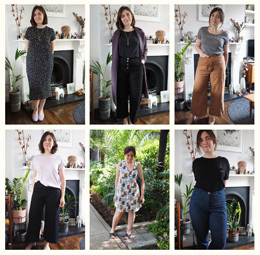 There’s a real mix of stores – at least thirty along the street in total – from tatty wholesalers staffed by grouchy older men to prettier shops with young staff and piles of Liberty-style cottons, printed and plain jerseys in a rainbow of colours, chiffons, denims, and notion stores with rolls of lace and ribbons hanging from the ceiling and the windows piled high with buttons. Anything you would need I’m sure you’d find here. I suddenly became quite gutted that we only brought hand baggage, so had to restrict myself quite severely or face a £50 excess baggage fee. Perhaps the fee would have been worth it as nearly all the fabrics were in the 10-25 shekels per metre range (£2-4), and there was so much stuff that’s hard to come by back home, so it was pretty painful resisting the urge to buy IT ALL. This is regretfully all I came home with. 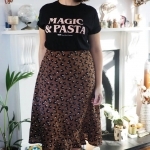 A ponte knit jersey printed with pixellated roses and horizontal lines. Josh remarked that it looks like an old 70s sofa, but I think the colours are beautiful and I have the perfect vintage dress pattern in mind for it. And 2m of blue/grey stretch denim for a pair of jeans – not very exciting but only £4/m and hard to find over here, so I couldn’t pass up. The quality seems good and I’ve done my pre-wash ready to get sewing. 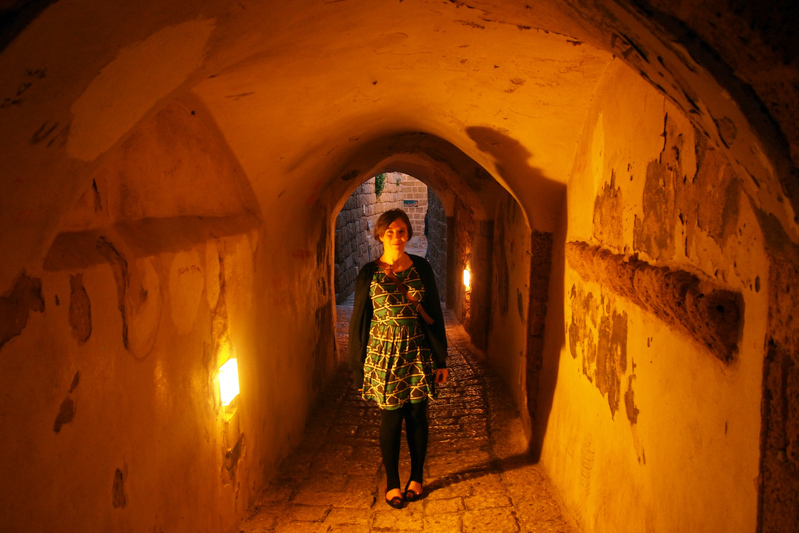 Bonus snap of my Franken-Anna in Jaffa’s Zodiac alleys! So if you go to Tel Aviv, moral is: pack a big suitcase. 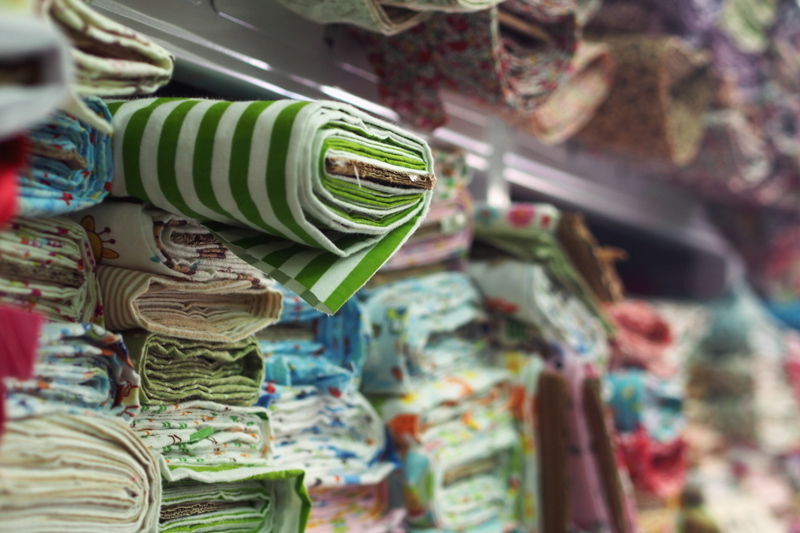 that’s like fabric heaven! look forward to seeing your makes. i don’t know how you chose from that huge selection. i’d have paid the £50 charge! I wish I had now too! Oohh– I like your choices. 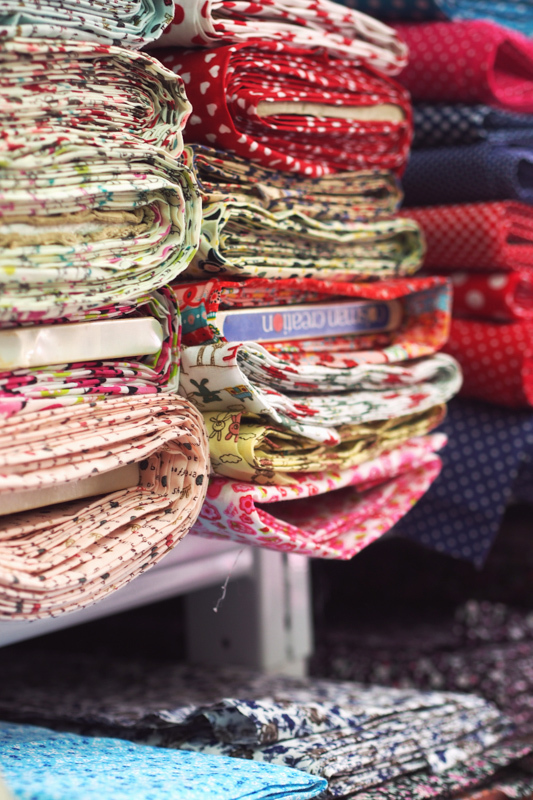 Fabric heaven! It would have taken me forever to decide what to get — you did well in a weekend. Oh my goodness! I LOVE, LOVE, LOVE that place! 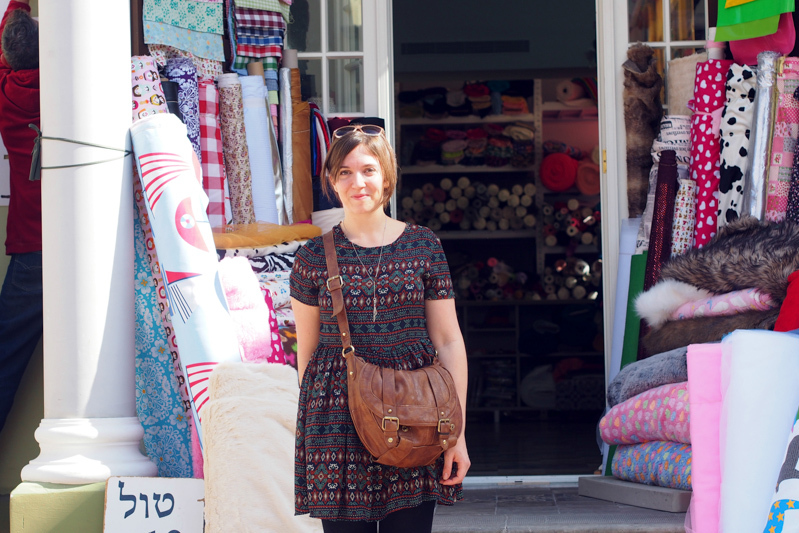 I lived in Jerusalem for a year and went fabric shopping in Tel Aviv probably a dozen times. But since I just started sewing during that year (I borrowed a sewing machine from a Bernina shop owner in J’lem :), I didn’t really know much about which fabrics were good quality, would work for my purpose etc. I absolutely have to go back there some time! Ah that’s so cool. I only spent half a day in Jerusalem, I’d like to see more of it one day. How fun! 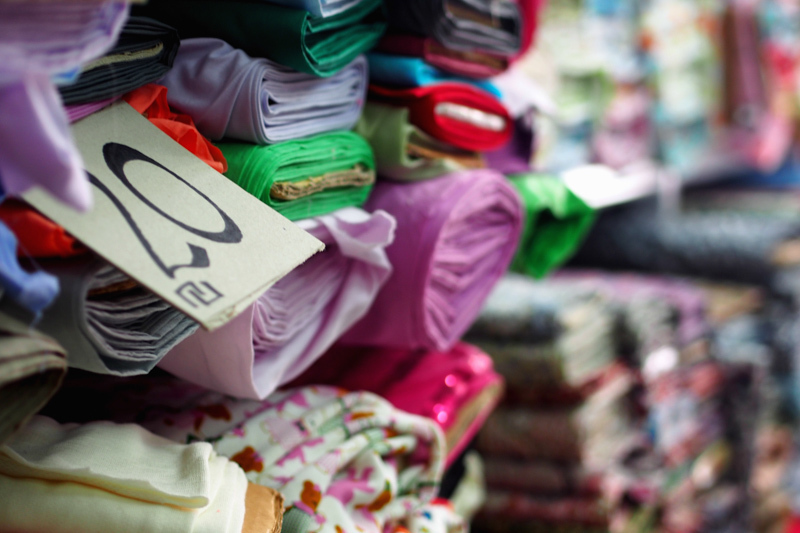 It was wonderful that you could plan fabric shopping into your trip. Can’t wait to see your jeans! Love that jersey. I can’t believe you were so restrained with your purchases, I think I’d have had to pay the excess baggage charge! Wild! I’m impressed you exercised such restraint. That denim is going to make a great-looking pair of jeans! Wow! That street looks like a dream! Hi ,I am so glad I found your blog . 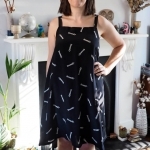 I literally put sewing bloggers into Google and you were lone I chose. I am a novice sewer, I try and remember what I learnt at school but at 51 that was a loooooooong time ago. I would love to follow you and learn as I go if you don’t mind being my teacher. Oh what indulgence.. what fun. 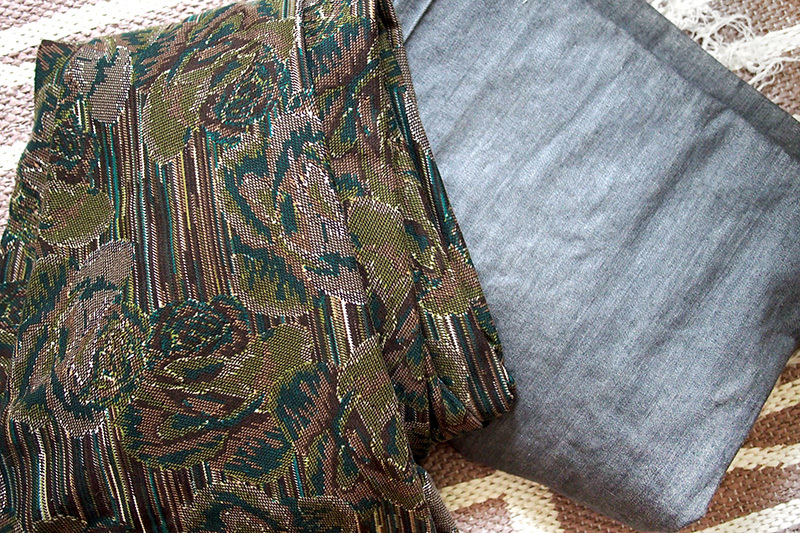 I went fabric shopping in London goldhawk road and had super fun. Would love market shopping kind of experience like you did here. Thanks,Preethi. Wow. I love sewing and travel so this would be a dream destination. I think I would have to have excess baggage!!! I’m going to Israel in April! How does the meters equal in yards? I’m from USA. And into US dollars? Looks like great place to shop! My daughter wants me bring some material back for her! I also think I will be bring some back for myself! 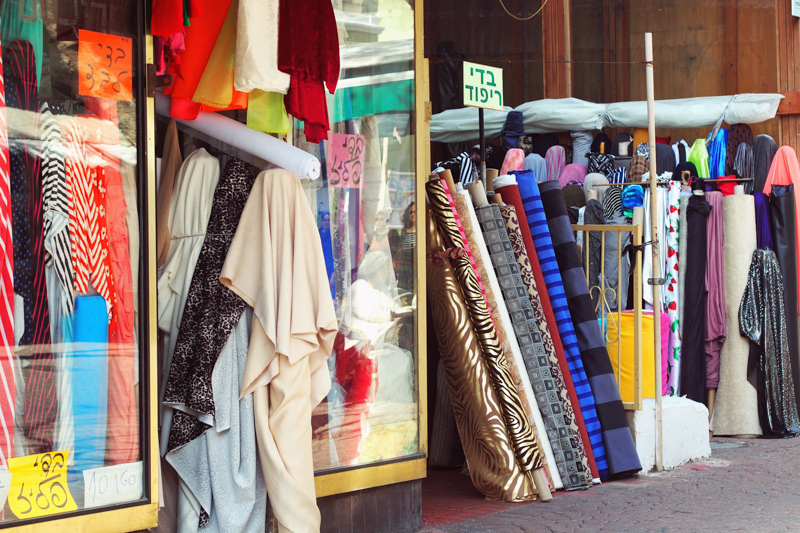 Do you know if any of the shops on Nachalat Benyamin are open on Shabbat/Saturday? I’ll be in Tel Aviv in November. Hi Caryn, I can’t really remember but I doubt it – most of the shop closed there on Saturdays. Cant say for sure though. Thanks for this useful post! 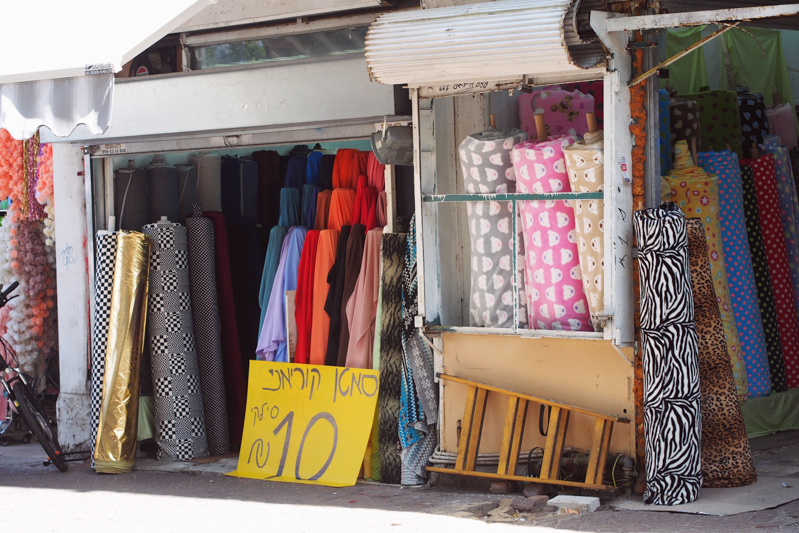 I was in Tel Aviv today and got some lovely fabric on Nakhalat Benyamin street. So much choice – and there were plenty of shops open (not all) even though it was Sunday. Thanks! 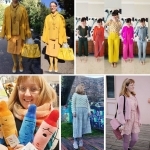 Gratefull if you could tel me where can I buy cheap sweing Patterns in TelAviv? 2 years ago my sister in law said she didn’t understand why I didn’t see myself some dresses. So I opened up my seeing machine after it standing idle for many years (I sewed a lot and bought fabrics from the markets ). The material shop in my town was quiet expensive and I am not a seamstress and only make for myself. I remembered Nahalat Binyamin from years back so decided to take a day out . 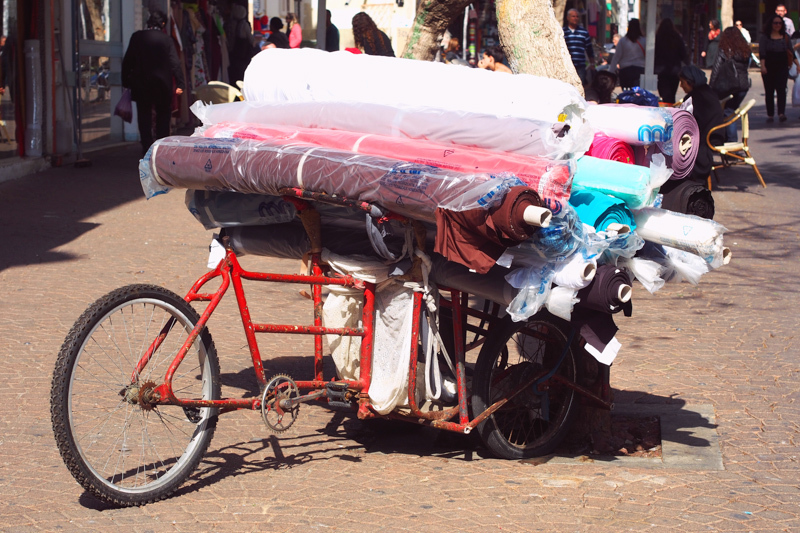 Lucky for me I took a stroller bag because I was in fabric paradise and loaded up at 10 shekels a metre. I even found for 5 shekels…but you have to be careful of defects. you can gind for any occassion and therecsre more up msrket shops. Always buy that little extra . I got my cottons and laces etc. and other sewing accessories. The street fsir was lovely to see but I do prefer a quieter day and when the benches are free to sit on. I take stock and often go back to a store.